On the day that Arts Council England announces its National Portfolio of organisations for regular funding over the next four years, Editor-at-Large Peter Bacon picks through the spreadsheet so you don't have to. There are a couple of clear winners in the announcement of National Portfolio organisations favoured by government funds for the next four years, and no obvious losers, while for most of the jazz world in England and Wales, things are set to carry on pretty much as before. Out front with a 66% hike in its yearly grant is Manchester Jazz Festival. For 2018-22 it will receive £150.5k pa. Today's press release from the festival includes this response: "The funding uplift will help to ensure that mjf’s live music offer is enjoyed by all and will support mjf with its continued focus on identifying new talent and finding new audiences through collaborations, digital media, and presenting music in fresh and unexpected ways." Coming in second with a 37% increase is Jazz re:freshed - it will receive £130.7k pa. The National Youth Jazz Collective looks, at first glance, to be at the back of the field with a 48% drop in yearly funding, down to £64.4k, but this is explained as a "technical reduction" as there is a realignment of how much of the organisation's government support comes from the Arts Council pot and how much from a Department of Education grant. The assumption seems to be there is no overall change. All the other specific jazz and jazz-related organisations which have been part of ACE's National Portfolio scheme will receive unchanged grants in cash terms for 2018-22. Brownswood Music Ltd/ Gilles Peterson - £89k pa.
Cheltenham Festivals (NB, this is for four festivals, one of which is jazz) - £213.5k pa.
East Midlands Jazz - £77.4k pa.
Jazz North - £190k pa.
National Youth Jazz Orchestra - £125k pa.
OTO Projects - £74.9k pa. Performances Birmingham Ltd (Jazzlines) - £80.4k pa.
Serious Events Ltd - £452k pa.
Tomorrow’s Warriors Ltd - £208.7k pa. Capsule Events Ltd - producers of the Supersonic Festival and Home Of Metal - is a new portfolio organisation with 175k per year. Inner City Music Ltd (Band On The Wall) has received a 90% increase to £180k per year. 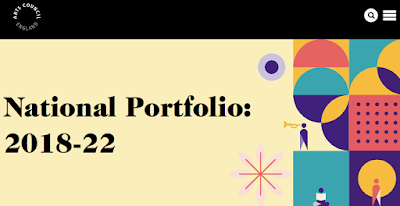 NTS Live the radio station which was founded in 2011, and has worked with Sun Ra Arkestra and Christian Scott is a new portfolio organisation with £69.2k pa.
Octopus Collective Ltd is up 75% to £70k pa.
Small Green Shoots is up 41% to £120k pa. Most of the large arts centres and theatres which programme some jazz received unchanged funding grants for the next four years or very slight reductions. And, finally, the eye-watering increase award goes to Manchester International Festival. Their funding leaps up by 1123% to over £9 million pa.